Essential might be up for sale, but Andy Rubin suggests its next product will be "game-changing"
Bloomberg today has it that Essential Products Inc., maker of the intriguing Essential Phone that debuted last year, may be up for sale. Reportedly, people familiar with the matter say that Essential has "canceled development of a new smartphone" while hiring advisors from Credit Suisse Group AG in order to find potential buyers. Allegedly, at least one (unnamed) suitor has already shown interest in acquiring Essential. According to Bloomberg, the company is considering a complete sale, including all hardware products and patent portfolio. Not long after Bloomberg's report hit the Internet, Essential founder (and former Android boss) Andy Rubin responded to it on Twitter. While Rubin doesn't really deny (or confirm) the fact that Essential is up for sale, he does clarify some things, including the fact that his company "always" has multiple products in the making, and does not shy away from "canceling some in favor of the ones we think will be bigger hits." So Bloomberg seems to be correct in affirming that a new Essential phone was canceled. Nevertheless, Andy Rubin mentions that the company is currently "putting all efforts" into developing "future, game-changing products, which include mobile and home" devices. This being said, we're certainly expecting a new Essential smartphone - other than the canceled one - to arrive soon as part of the company's mobile plans. It remains to be seen whether or not this upcoming handset can be game-changing, and if Essential will have a new owner (or maybe owners) by then. Bloomberg notes that a final decision on the company's sale has yet to be made. 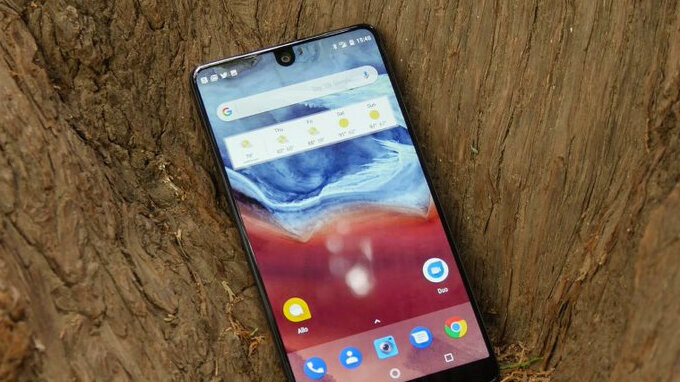 Launched in the summer of 2017, the first Essential Phone (model name PH-1, pictured above) was initially priced at $699 and didn't sell well. However, following price cuts, numerous software updates, and the introduction of multiple color versions, it's said that Essential has now sold over 150,000 handsets - not too bad for such a young company. The original Essential Phone kind of started the notch trend (if we can call it that), and it's still one of the most interesting handsets on the market - thanks in no small part to the materials that it's made of (including titanium). We have to wait and see if the next Essential smartphone follows in its footsteps, or if it's going to carve out a new, wild path. Very wrong if you think an iPhone is the be all and end all of Smartphones. K, go back to your mama's basement. Let's help him tuck his bed. He might even need an adult diaper. No phone is perfect, you dumb. master mkk is the perfect isheep mascot. Disrespecting people's choices just because the product don't have an apple logo. Anyone buying an iPhone 8, 7, 6s, 6, or the plus versions is an iDiot these days. They are overpriced, and limited in both hardware and features. Stop that, this phone is not essential at all. No seriously, stop that, not only you're repeating a joke that is as old as this phone, but you're so thirsty for attention that you had to post the same "joke" twice in this comments section. I hope they do release at least another phone. I loved my Essential phone and I would ditch my S9 for the second iteration of the phone. They have a great team that keeps on pushing updates for the software, and always communicating with their community on Reddit and listening to what they want in their next software update. Add to that the great design, and the top notch build quality. I hope they do well and survive, and bless us with another piece of hardware. I'm using one right now and can honestly say the build quality is the best in the industry and materials are actually premium. The only con I can think about is the speaker and it's location, apart from that, definitely the best phone I've ever owned design and build quality wise. Well said man. Fingers crossed they hang around yet one way or another. Love mine a lot. Would you get this over a One Plus 6? Yep!! Especailly, when my essential phone is $450 cheaper for the same 128GB. Definitely. I'm not exaggerating when I say that with a proper Gcam port, you do get pictures that can challenge the Pixel 2's quality. It's a great device that was ruined by the early reviews that were rushed and never gave Essential the same treatment they give to other OMEs. They always leave a disclaimer that the phone they're reviewing still running on a pre production software, but they were quick to shoot down the Essential phone and talk about how terrible the camera and software were. I guess this phone was not essential at all then. Lol you are fully brainwashed. Enjoy your teenager's toy. Seriously imagine Amazon really take the deal and fire another round of smartphone with Alexa. No surprises here. Using Android was a big mistake.